While on the calendar it may be spring it still feels like winter! It was 18 degrees when I left the house this morning and I had a ton of snivel gear on, which was all necessary. One thing I have to remember when wearing the polar fleece is that at a maximum, I can only wear a t-shirt and a long sleeve underneath but this morning I overcompensated with an extra layer. 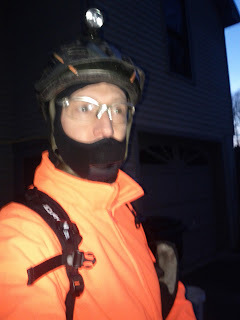 I didn't need my helmet light either because by the time I got out of the garage (6:45) it wasn't necessary but running as late as I was there was no time to switch. Since I didn't have my laptop, I took the long route which is essentially from my house to the center of town and towards Danbury via Route 302. A variation to the long route is the long and hilly route by way of Castle Hill. Again a route in which I am not carrying my laptop. 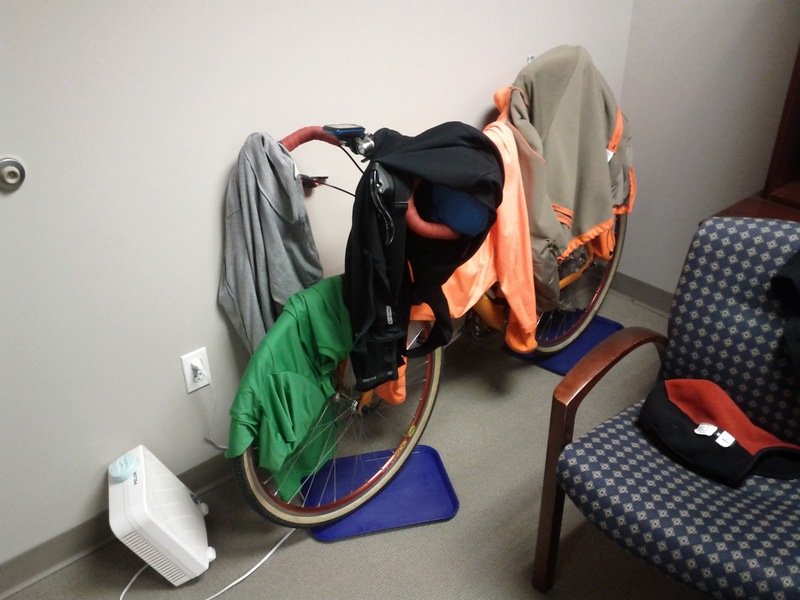 If you are wondering what's up with my laptop, I have an engineering laptop which weighs nearly 10 pounds and if I am going to ride with it, I am riding the shortest route possible with it. The bike once again performed like a champ! It's such a joy to finally have a great bike to ride to work on. Not that all my previous commuters weren't good, too, but you just know when you have that perfect combination of equipment that makes the ride so enjoyable. Not even in the new office a full week and it's already been christened with the bike. I had a lot of gear on that needed airing before doing it all over again. 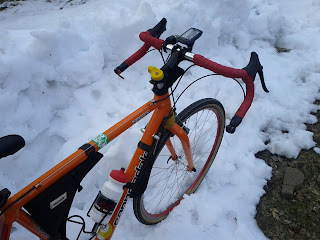 Prior to getting redressed to ride home it was actually snowing outside (flurries) so I knew that all the snivel gear that I rode in with will be going back on, again. 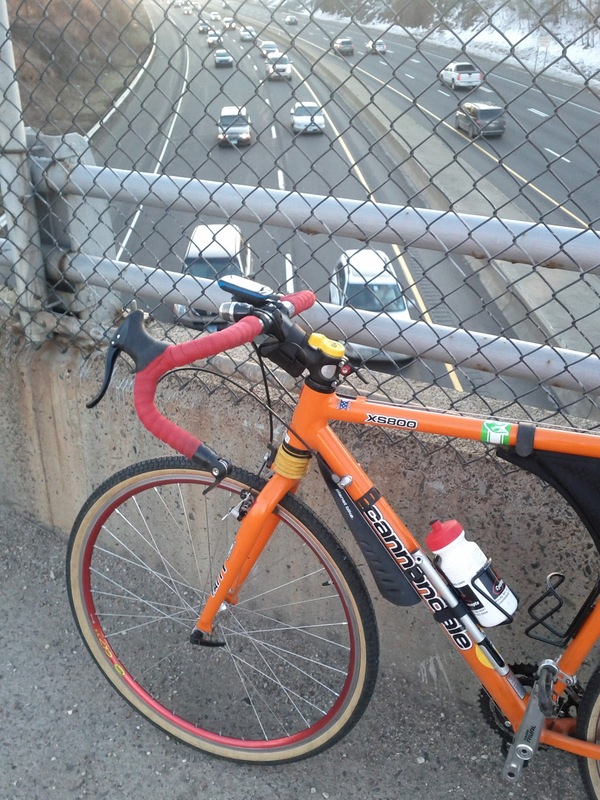 I was able to repack my Timbuk2 with my morning gear and the laptop and lug it all back home. It wasn't that bad but I think I am going to try a back pack next. Since I barely rode last year, this year I am going ride as much as possible and mix it up a bit between the geared bike and singlespeed. 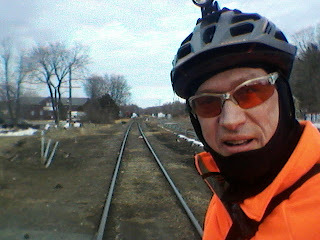 In fact, I found 20 mile route for riding home (sans computer) that I am going to try next time!